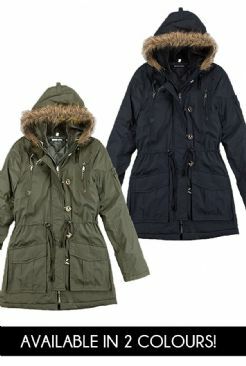 This Military parka is not only practical and ideal to keep you warm this season.. but also extremely fashionable and a bargain at a fraction of the retail price. Available in Khaki or Black and running from sizes 8-16. Hood With Faux Fur Trim, Soft Feel Lining, And Pull Tie. Zip Fastening With Large Button Overlay.